Numicon begins with the premise that the richer a person's concept image is in terms of number, the more competent they are likely to be in arithmetic, particularly mental arithmetic. There is a tendency, nowadays, to move very quickly towards symbols in mathematics. However, symbols are arbitrary and do not necessarily develop the child's number concept, and although the child may be able to write and manipulate symbols, in order to develop mathematically they need a firm, clear and rich number concept. Otherwise, there is a danger that the pupil can arrive at the correct answer but without necessarily knowing why. The development of concept images for number is closely linked to the tendency to look for patterns. Human beings are programd to find patterns, and find these in nature, in other people's behavior, even in clouds in the sky. However, recent numeracy teaching has tended to deprive children of patterns, yet a clear number concept depends very largely on the understanding of the patterns of relationships in numbers. This is particularly relevant to children with Down syndrome who tend to be good visual learners, and are good with patterns, but tend to have poor auditory memory. 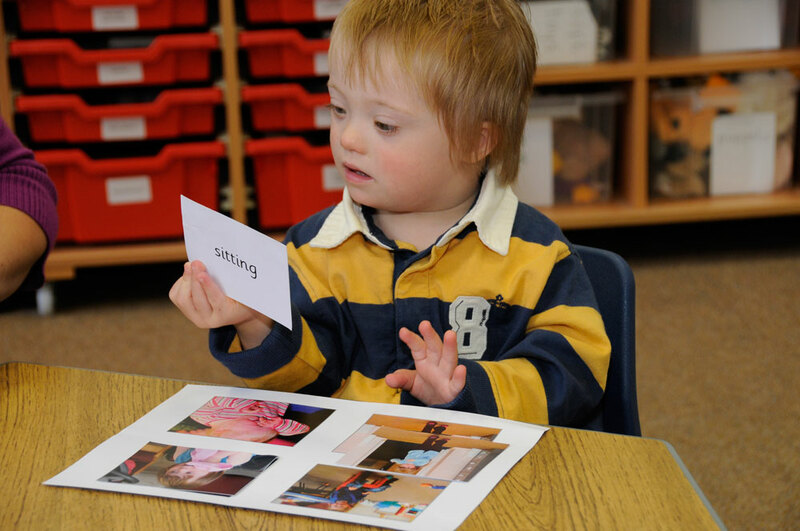 The literacy skills of children with Down syndrome tend to exceed their numeracy skills, and numeracy difficulties are frequently reported as being of concern amongst teachers and teaching assistants working with pupils with Down syndrome. Recent numeracy teaching does not tend to make use of patterns, but relies heavily on counting. Children are asked to count large numbers of randomly arranged objects and pictures, and also to learn how to count on using a number line, neither of which help them to develop their number concept in terms of the consistent patterns in the numbers being used. The Numicon materials specifically address this and aim to develop the richness of the pupil's number concept, with the Numicon materials providing information for the pupil on position, action, pattern, color and shape. It is very clear to see, from a Numicon plate, whether a number is odd or even, with the tendency to see in the patterns being very clearly illustrated by the typical responses of both adults and young children when presented with such a plate, that there is either 'one missing' or 'an extra one', when compared with the next Numicon plate, either larger or smaller, which will be an even number. The Numicon approach was originally developed in an Infant School in East Sussex with the support of a research grant from the Teacher Training Agency. It was designed for use with children in mainstream at the beginning of their educational careers. Numicon was adopted in the nursery and reception classes, at first in a very informal way, and then gradually developing the children's number concepts one upon another as they matured. The approach was extended into Year 1 early in 2000 and it is hoped that the Year 2 program of teaching activities will be available next year, taking children up to the end of Key Stage 1. It was found that the materials were very popular with the pupils, who were encouraged to be imaginative with them, and that strong visual imagery and understanding of pattern were being developed. The tendency to move too quickly into symbols was resisted, and in the early stages it was important to ensure that the pupil knew the pattern, and how it related to other patterns rather than naming the numeral. At the Infant School in East Sussex it was found that the children's UK Key Stage National Assessment results improved markedly after using Numicon, number concepts were richer and more firmly established and that children understood and enjoyed mathematics. 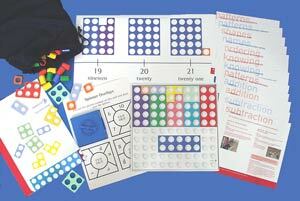 It seemed that the principles of Numicon should make it very applicable to the needs of pupils with Down syndrome, and one mother in Wiltshire had already begun to make use of the Numicon materials after having traveled far and wide to find an appropriate mathematical program for her daughter. The research group consisted of 11 pupils in Key Stages 2 and 3 (8 to 13 year olds), all with Down syndrome, seven being in mainstream schools with support, two in special centers attached to mainstream schools and two in special schools. The group included four boys and seven girls. The children in mainstream schools were supported one-to-one with a teacher assistant in a small group and in classroom situations, with some children having access to one to one support for a large proportion of their day. The other children were taught as part of a small group either in a specialist center or in a special school, and children received between 10 to 15 minutes on Numicon every day except during school holidays, with two parents working formally on activities at home. The children varied greatly in terms of their strengths and difficulties, their personalities, attention control and motivation for maths activities. The pilot project was introduced with a training day presented by the designers of the Numicon Maths System; Dr Tony Wing, Senior Lecturer in Mathematics Education at Brighton University, Romey Tacon, Headteacher and Ruth Atkinson, Maths Co-ordinator at the Infant School where it was developed. As far as possible teachers, and teaching assistants attended the training day, at which a Year 1 kit of Numicon materials was distributed. One kit was issued for each school or pupil, with the agreement that the schools would be able to keep the materials at the end of the project - an agreement which they were later very motivated to remind us of! After the training day, staff were keen and enthusiastic, and most pupils took to the materials, enjoying the shapes and colors, and it became clear that the children rapidly developed their concept images and recognition of the patterns. Two educational psychologists were involved in the project, one in the north and one in the south of the county, and all children taking part in the project were assessed for vocabulary levels and the development of basic number concepts using the British Ability Scales II (BAS II) Naming Vocabulary and Basic Number Skills assessments. The Basic Number Skills assessment was repeated at the end of the four month project to quantify the progress which was made. Most pupils quickly learned how to order the plates in size without having to count individually. However, some pupils needed reminding to think in terms of patterns and to apply their knowledge of Numicon plates when presented with problems. Because of their previous teaching, many of the children found it difficult to think in terms of patterns when presented with real maths problems and tended to revert to old strategies of lines and dots, and we felt that this may be a reflection of the fact that this was the approach they had been using throughout their school careers until the introduction of Numicon. It was found that children who were encouraged to use the Numicon materials in maths lessons and when presented with maths problems tended to be particularly successful on the follow-up assessment where Numicon materials were allowed. It was found that some children needed specific teaching of number language for example, 'big' and 'small', and this highlighted gaps that may otherwise have been overlooked at this stage. Children rapidly felt confident about using the materials and were not threatened by its use. The multi-sensory nature of Numicon was found to be very helpful to the pupils, including activities such as touching and feeling the Numicon shapes without being able to see them, and activities like these quickly helped to establish the children's understanding and made use of attributes such as size, color and pattern to help them to identify the shapes. Children quickly learnt to see the number without counting, with many children achieving this within days and one child developing an understanding of numbers 1 to 5 within three weeks, where this understanding had largely eluded her before. It was clear that the depth of the children's concept image was increasing as a result of using the materials, and that the materials were also facilitating the development of language, providing information about position, relative sizes, odd and even. One child began to use the Numicon materials to estimate, and another who had previously hated maths became confident, boasting of her ability and staying on task much longer than previously. As with other teaching, it was found that some skills were lost after a break for a holiday, but these were rapidly regained after a few days. It was found that the use of materials identified large gaps in the understanding of mathematical concepts and language, and that this was picked up quickly using the Numicon materials: children enjoyed the materials very much, becoming very motivated by them, and possibly rather dependent upon them, although this was to be expected after such a short term project. Generalisation and extension activities are part of the Numicon approach and it would be necessary to move towards these rapidly, and to include these at the earliest stages. A specific request was also made to consider the ways in which Numicon can be used to develop and extend the children's understanding of money. The results are variable, but show an average gain on the number assessment of five months during the four month period of the study (Table 1). We consider these results to be extremely pleasing in view of the fact that the children do not normally make one month's progress per month, yet the average gain exceeds this, and many individuals have improved their skills at a much faster rate than the average. The pupils who have done best are generally those who are in mainstream schools with one-to-one support for numeracy. However, this group was also the group who attended the day's training. The special school group and the special unit group were given individual introductions to Numicon when they entered the project but it was clear that the day's training was necessary to ensure the most effective use of the program. In addition, the special school group had the added difficulty of a very mixed class situation which was not conducive to the regular use of the program, and this is reflected in the results obtained. Despite these difficulties, many positive comments were made from all those involved in using the Numicon materials and there was a strong motivation to continue the program, expressed by all the participants, no matter how effective the program had been in implementation. "This was the first time the child was able to complete maths with any real understanding." "This is the first time the child is completing mathematical tasks independently." One or two participants mentioned that children were getting fingers stuck in the holes of the Numicon shapes. This was a particular issue in larger groups, and very mixed ability situations. 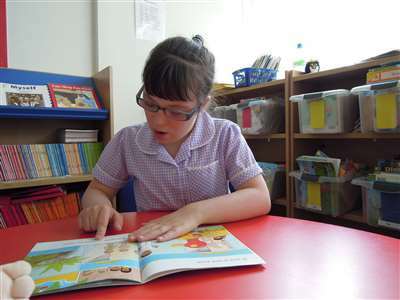 The children worked particularly well in one-to-one and small group situations but more difficulty was encountered in the larger classroom situation (12 or more special needs pupils). There was an issue of overcoming earlier learning, with children still tending to think in terms of lines and rows rather than in terms of the Numicon patterns, and also tended to revert to earlier learning when difficulty arose. None of the children had, of course, been introduced to Numicon as their first introduction to numeracy. In connection with this, it was found that some children needed a considerable amount of time to become familiar with the materials. Without full training some teachers and teaching assistants may have been tempted to move too quickly through the activities rather than consolidating the images and concepts, once again emphasizing the importance of the full day's training. It was felt that the pupils needed specific activities to help them to generalise and many needed more consolidation at particular levels, and other staff suggested that extension activities would be useful, and money in particular was identified as a need. As most of the children's skills were approximately half the level of their chronological age, we would have expected approximately two months progress in numeracy in four months. On average the children made five months progress with a range of one months progress for a child who was not using Numicon on a daily basis up to 11 months progress in the four month period, made by a child who had been using Numicon for six months previously and was also working on activities at home. There were some issues raised, but none were fundamental concerns. Attitudes of both staff and pupils were extremely positive, and there was a strong determination to continue with Numicon after the project was over. For information about available resources, see the Number resources list. Wing, T. (2001) Serendipity and a special need. Mathematics Teaching, 174, 27-30. Wing, A. and Tacon, R. (1999) A Visual Approach to Mental Arithmetic, Presented at (and published in the Proceedings of) BCME-4, University College, Northampton.